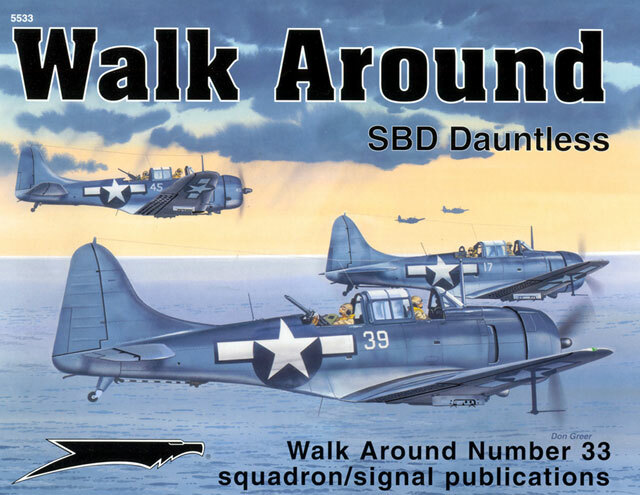 Squadron/Signal Publications go back in time with the latest addition to their Walk Around series. This time the Douglas SBD Dauntless is given the treatment. This Walk Around is authored by Richard S. Dann with colour by Don Greer, and artwork by Dave Gebhardt and Darren Glenn. To my knowledge, this is the third Walk Around authored by Rich Dann, the other two being the F4F Wildcat, and another Douglas product, the A-1 Skyraider. His two previous efforts have been excellent and the Dauntless Walk Around continues in the same vein. As with all of the Squadron/Signal Walk Around series, the format is photographic coverage supplemented by comprehensive captions, line drawings, and colour profiles. The whole airframe is covered commencing with the different types of propeller and wends its way around the engine, cowling, cockpit, armament, including ammunition storage, gun mounts and the guns themselves, radios, hatches – and what's in them, bomb racks, antenna and aerial mounts, arrestor hook, undercarriage, pitot, landing and navigation lights, flaps/dive brakes, control surfaces etc, etc. The photographic coverage is great with full-colour shots of three preserved aircraft as well as sharp clear black and white war-time ones some of which are well known but quite a few will be new to even the most hard bitten fan of US naval aviation. 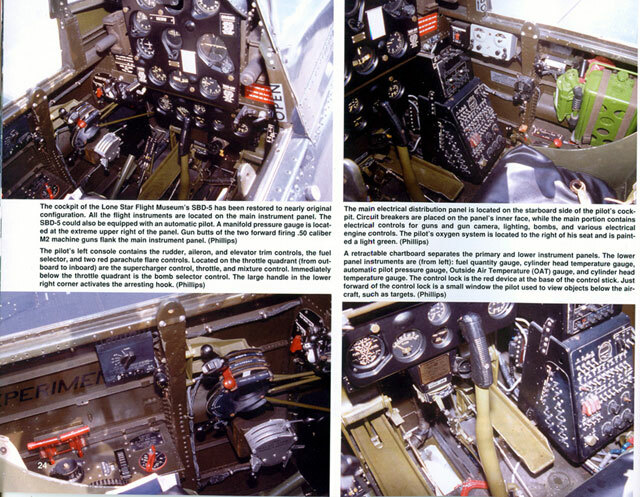 Contemporary colour photographs can be a trap for young players as restored airworthy aircraft tend to have been modified with updated radio and navigation equipment but to Squadron/Signals credit, the captions point out these differences and additions. 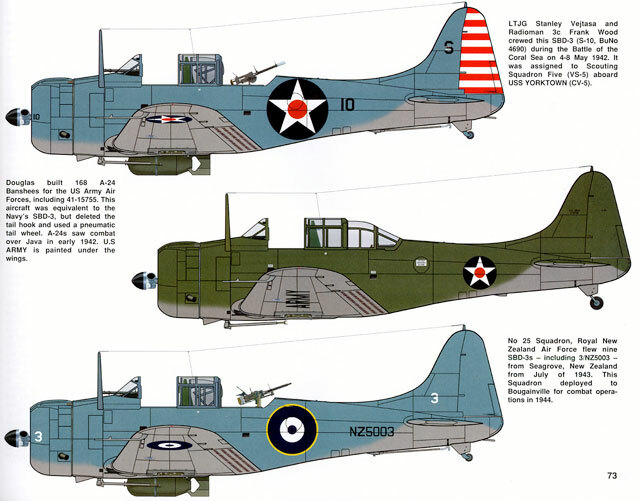 By reading the captions to the photographs you are given the whole Dauntless story through all of the different variants from the SBD-1 through to the SBD-7 in U.S. Navy and U.S. Marine Corps usage as well as foreign operations by New Zealand, Mexico, France, the UK (trials only). Coverage is given for the U.S. Army version, the A-24 Banshee. The book is in landscape format with 79 glossy pages that contain 107 full colour photographs, 85 black and white photographs, fifteen line drawings and 12 colour profiles between cardboard covers.